Included in this chapter is a pot pourri of features that defy easy classification. 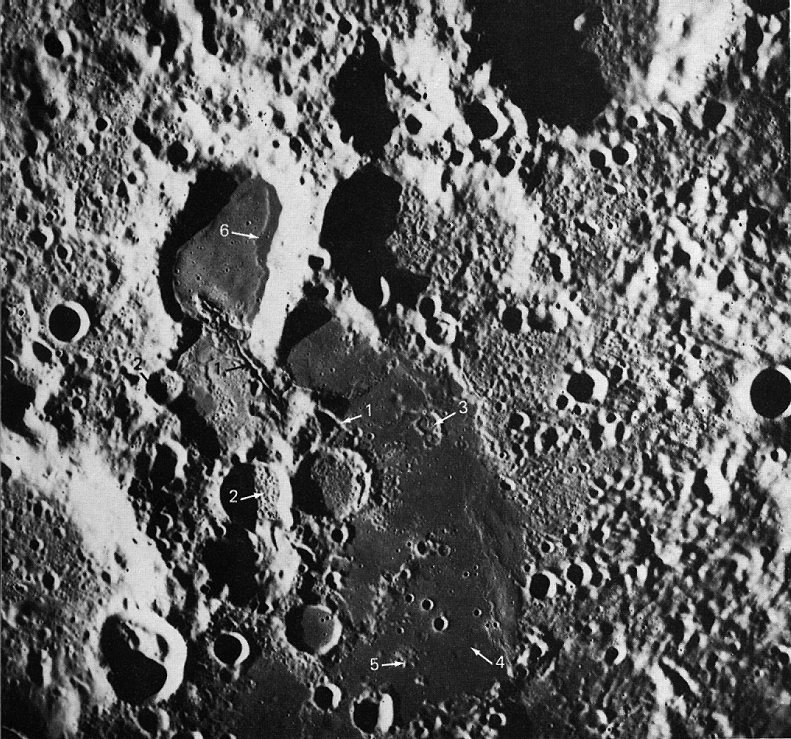 Many craters with unusual shapes are represented that may be volcanic rather than impact in origin. 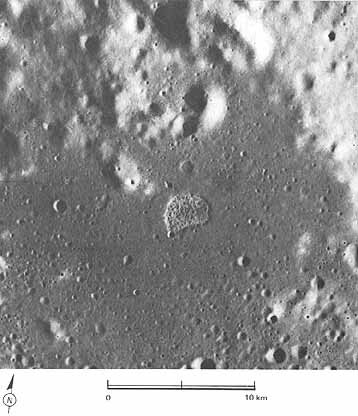 Other craters have irregular hummocky deposits on their floors; still others may be covered by lava flows. Other features depict collapsed lava tubes or depressions formed by drainage of fragmental surface material into cracks. Together they constitute a fascinating group of features, and they are grouped in this chapter because, at the resolution of the Apollo imagery, more than the usual uncertainty exists in attempting to interpret their origin. Perhaps later Moon landings or a comparison of these pictures with orbiter photography of Earth, Mars, and other planetary bodies will provide additional insight into the geologic processes that formed them.-H.M. 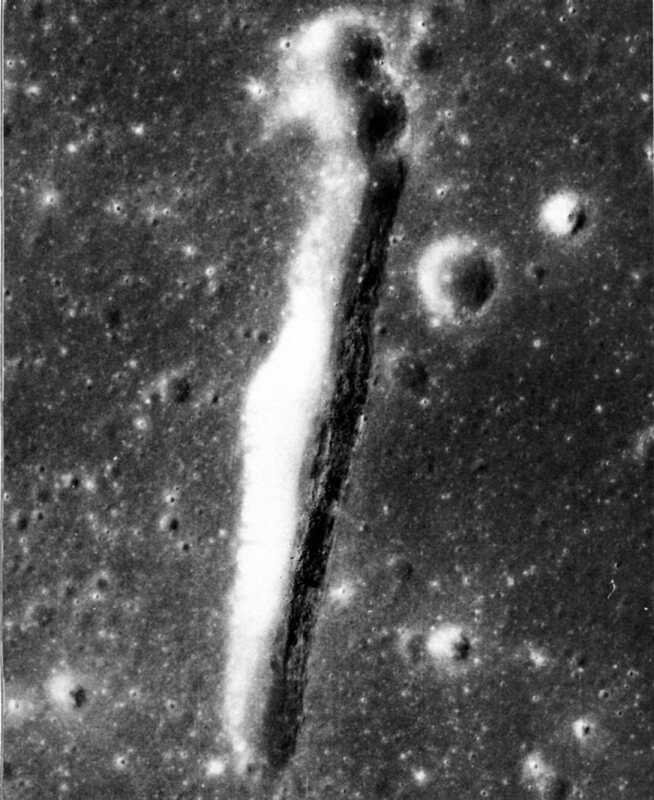 FIGURE 223 [above] .-Although this is a rather bizarre example, sharp, deep, spearhead-shaped depressions form the heads of many lunar rilles. 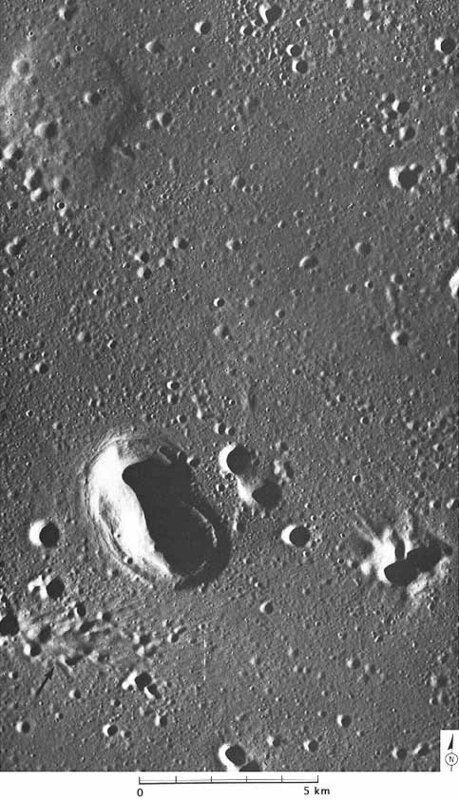 The best-known example is the depression at the head of Rima Hadley near the Apollo 15 landing site. They probably develop by collapse into voids left by lava tubes and shallow magma chambers. This is Aratus CA in western Mare Serenitatis. The branch heading northeastward to the right edge of the stereogram, which terminates a few hundred meters beyond the picture, is the rille-a very short one. The fresh-appearing wrinkle or mare ridge that crosses a small (300 m) young crater at A (see enlargement) may postdate the spearhead depression as its extension appears to protrude along the wall at B and the floor at C. It is part of an older, broader, more subdued ridge that has been disrupted by the collapse depression. Incipient collapse along the younger ridge is visible at D. Note how the mare surface truncates a resistant layer (presumably a basalt flow) in the wall of the depression at E. This suggests either the tilting of older mare basalts eastward prior to the latest extrusion of basalt or, more likely, that the resistant layer is lenticular.-D.H.S. 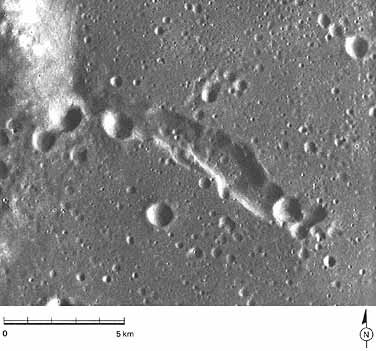 FIGURE 224 [above] .- On January 16, 1973, the Soviet unmanned roving vehicle Lunokhod 2 was landed by Luna 21 in or near this area in the southeastern part of the crater Le Monnier. This crater is a large (61 -km) pre-Imbrian crater cut into terra at the eastern edge of Mare Serenitatis before Serenitatis was flooded by mare laves. Part of Le Monnier's southern wall fills the lower part of the picture. 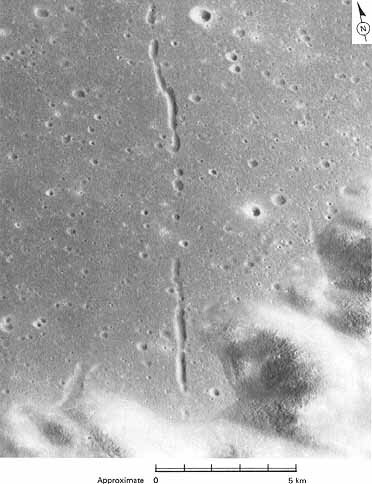 A conspicuous chain of elongate depressions has formed in the lava-filled floor of the crater. The chain trends 22 km northward and its pattern is quite surely controlled by an underlying fracture system. Regionally, the inferred fracture system is concentric to the grossly circular Serenitatis basin, and in this area trends northward. No comparably young structural features having the same trend cut the terrae surrounding Le Monnier. However, older structures having this trend occur in the southern and northern walls and rims of Le Monnier. The alined depressions on the mare are mostly 300 to 400 m wide and 30 to 60 m deep. The three deepest stretches are 1 to 2 km long and about 50 to 65 m deep. These depressions probably were the locus of fissure eruptions of mare basalt. Withdrawal of the last lava back into the fissure may have created subsurface voids into which collapse took place, causing the depressions and accounting for the absence of raised rims on the depressions.-R.E.E. FIGURE 225 [left] .-Although considerably wider and longer than the largest of the depressions described in figure 224, this one otherwise closely resembles them. It probably formed in the same way; that is, by collapse into a fissurelike cavity caused by the withdrawal of mare basalt. Closer viewing (and greater enlargement of the original frame) clearly reveals signs of mass wasting. Note the incipient slump fractures along the right rim and large fragments along the right wall and in the bottom of the depression.-G.W.C. 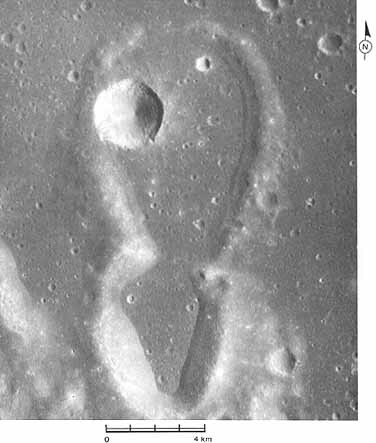 FIGURE 226 [right].- Low-rimmed or rimless depressions having irregular outlines are not uncommon on mare surfaces. 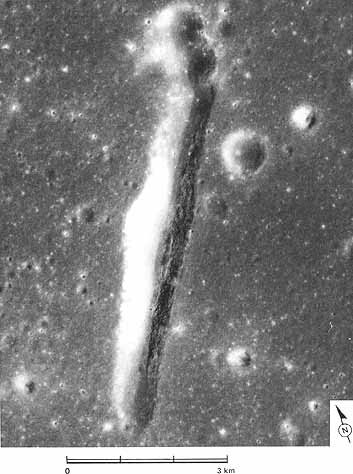 The one pictured, near the western margin of Mare Serenitatis, is about 10 km long and appears to have been formed by collapse and the coalescence of small craters.-D.H.S. 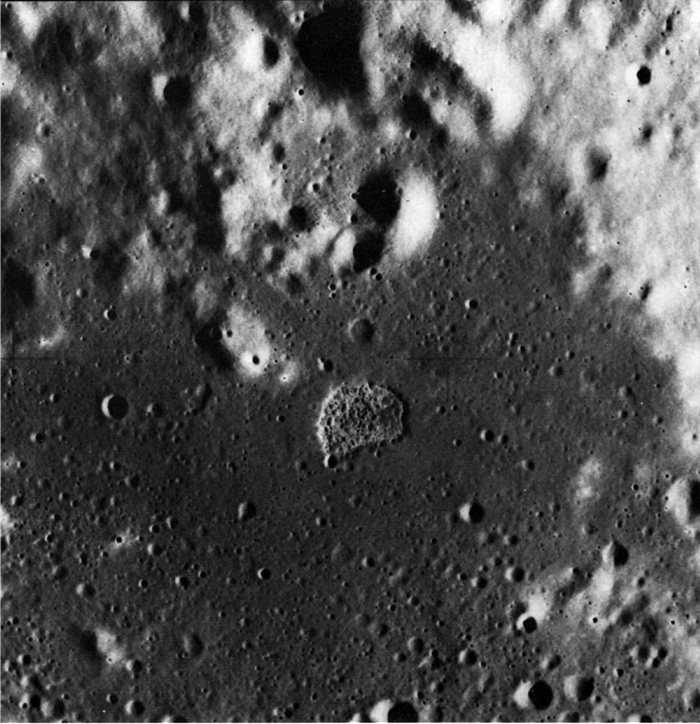 FIGURE 227 [above].- The largest crater in this picture is Aratus D in western Mare Serenitatis. 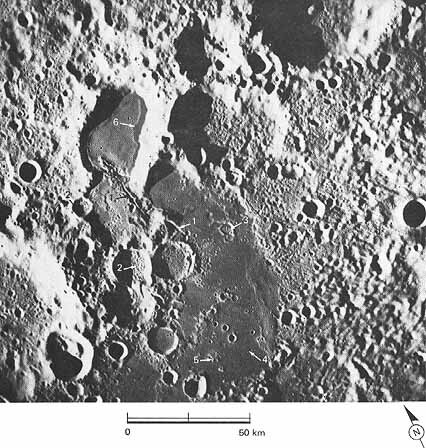 Its circular outline, high rim, and deep bowl-shaped interior are characteristic of many impact craters of comparable size and age. 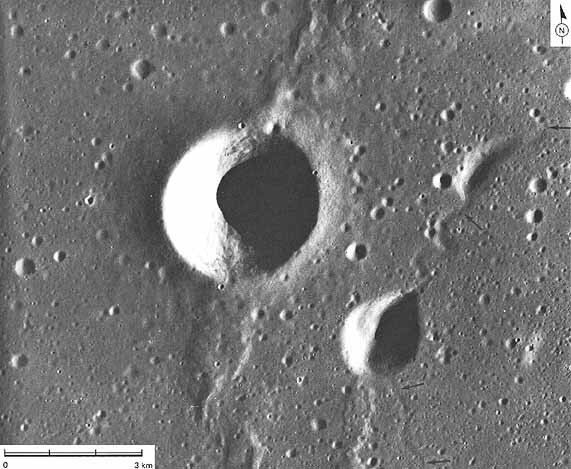 The next largest crater is tear shaped and nearly rimless. It is, furthermore, associated with a rille (arrows). These differences strongly suggest that it was formed or at least highly modified by structural collapse.-D.H.S. 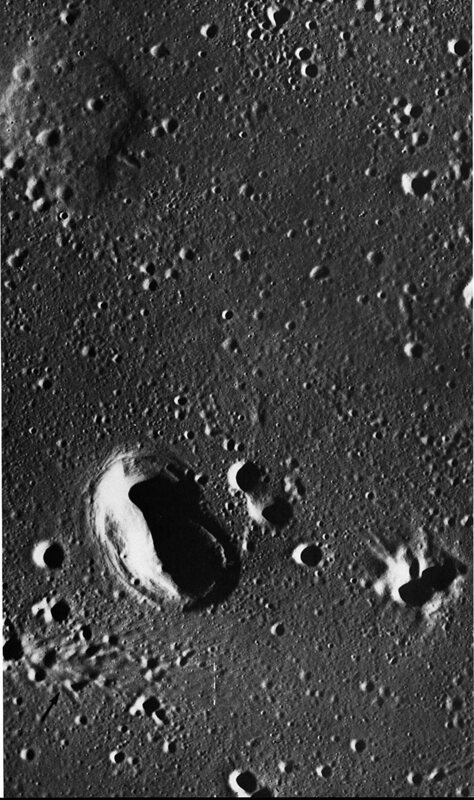 FIGURE 228 [above].- The very young rimless crater near the center of this picture is located near the area where Oceanus Procellarum and Mare Imbrium join. The crater apparently formed in regolith-covered mare basalt. It differs from lunar impact craters of comparable size and age by its lack of a raised rim, surrounding ejecta deposit, or associated secondary impact craters. In addition, its interior walls do not show the steep slopes with craggy outcrops of rock in their upper parts, nor the streams of debris-avalanche deposits and talus that are usually seen in the walls of impact craters of comparable age and size. Judging from the clear and sharply formed pattern of concentrically curved grooves and scarps that surround the hole, the material near this depression has apparently subsided into a subsurface void. 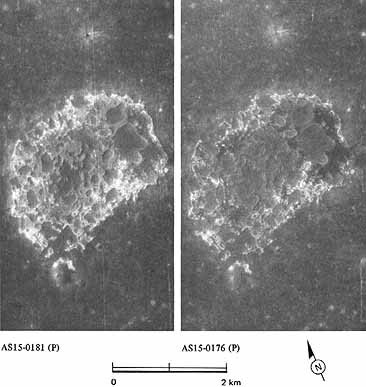 Because of the extreme rarity and inferred short lifetime of steep slopes on the Moon, the latest subsidence must have taken place very recently, after most of the 50- to 300- m diameter craters that densely pepper the nearby mare surface were formed. Movement of the regolithic debris layer during subsidence apparently smoothed out most, if not all, of the craters that must have existed near the depression. Now the depression is surrounded by low, curved fault scarps and narrow, curved grooves that may be fault troughs (grabens) or may represent drainage of regolithic debris into cracks that opened in the underlying sagging basalt rock. The few craters that have formed on the subsided surface compare in density to the craters formed on the cluster (arrow) of Aristarchus secondary impact craters and associated herring- bone ridges; comparable ages for the Aristarchus secondary features and the depression are thus indicated. The subsidence was triggered either by the ground shock or seismic wavetrain generated when Aristarchus was formed 300 km to the west, or by the impacts of the secondary features. The subdued depression in the upper left may be a similar older feature that was flooded by a later lava flow that now covers the area. 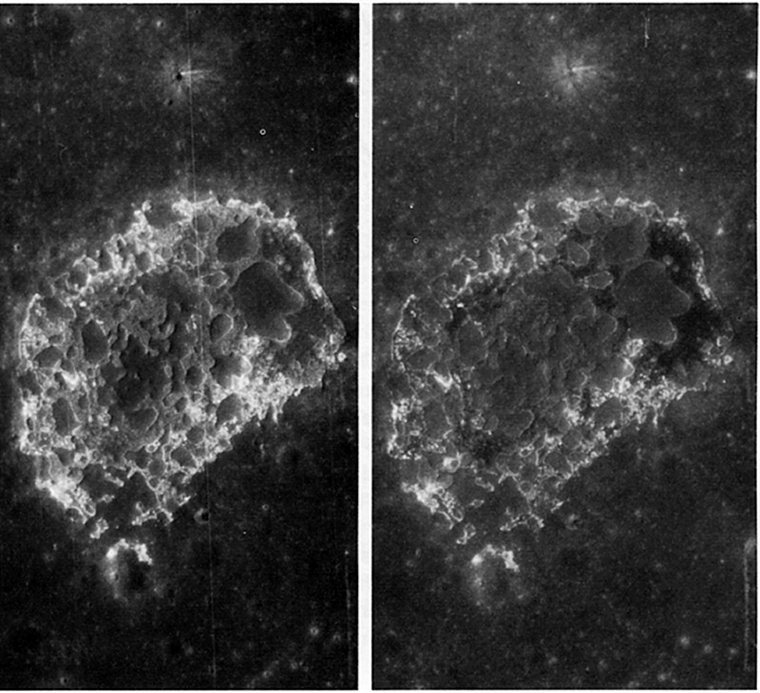 The density of craters within the depression and the density on the surrounding lava are comparable. Alternatively, the subsidence there may have been incomplete; however, there is no sign that this subsidence is as young as that in the deeper crater.-R.E.E. 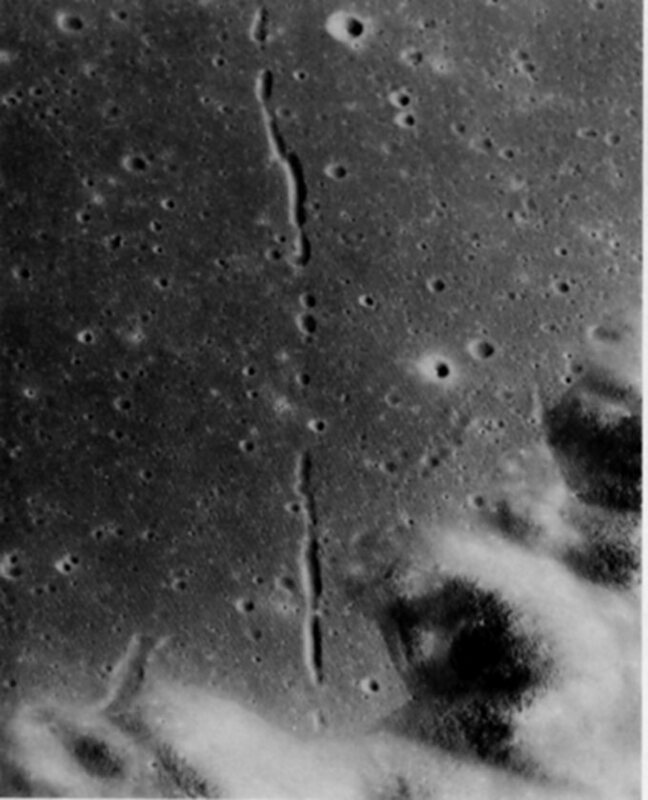 FIGURE 229 [left].- This 18-km-long ''figure 8" pair of noncircular craters near the crater Guericke probably was not formed by hypervelocity impacts of bodies from space. 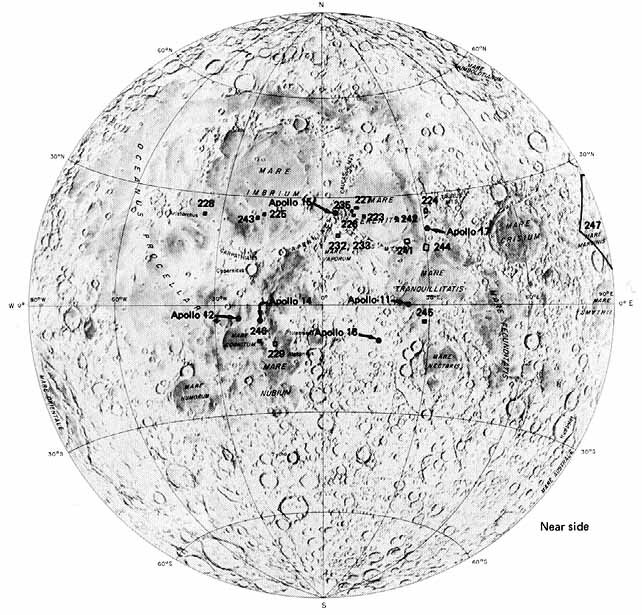 It could be a secondary impact feature formed by projectiles from the Imbrium basin 700 km to the north. The terrace at the base of the crater walls could be debris from the walls or a "bathtub ring" left by a formerly higher stand of the mare fill. Alternatively, the crater pair and the terrace could have been formed by volcanic eruptions. 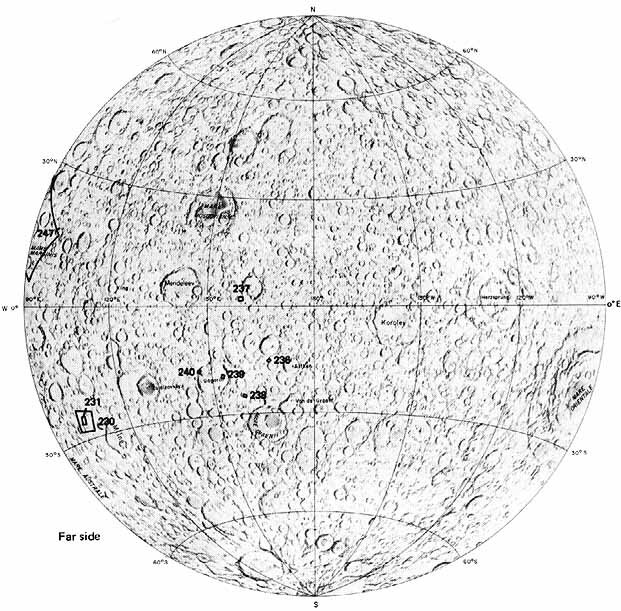 The superposed bright crater is younger than and unrelated to either the "figure 8" pair or the mare.-D.E.W. 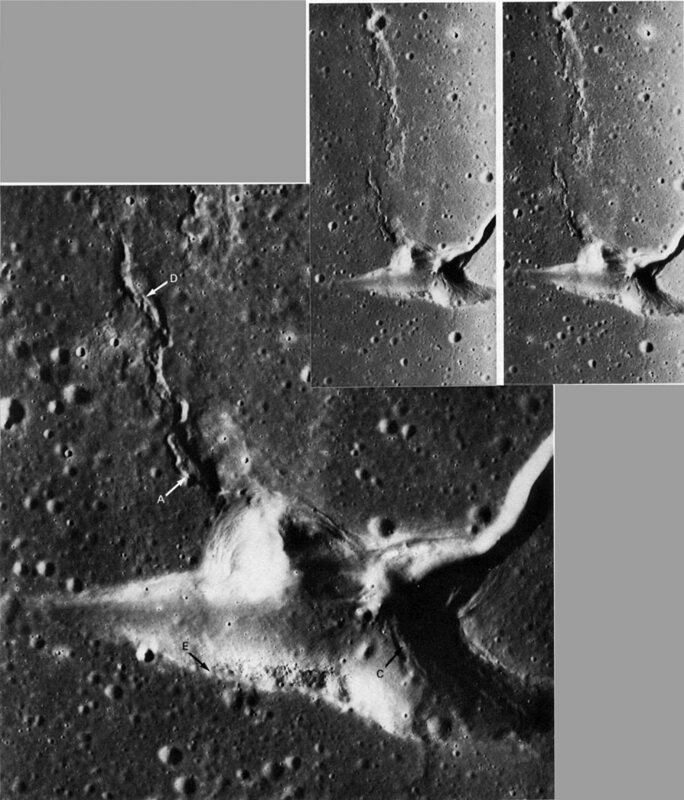 FIGURE 230 [left].- This area of mare material in the farside uplands centered at 26°S, 103°E shows many features. 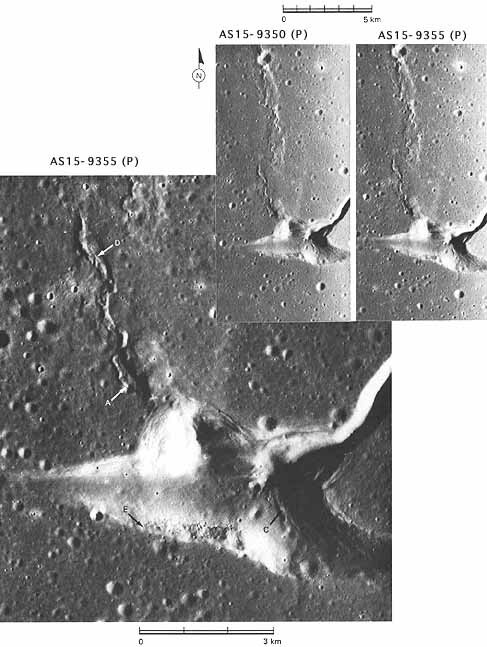 There are fractures (arrows 1) that may have been vents from which much of the smooth, dark lava was extruded; some of these fractures are bounded by lava levees. 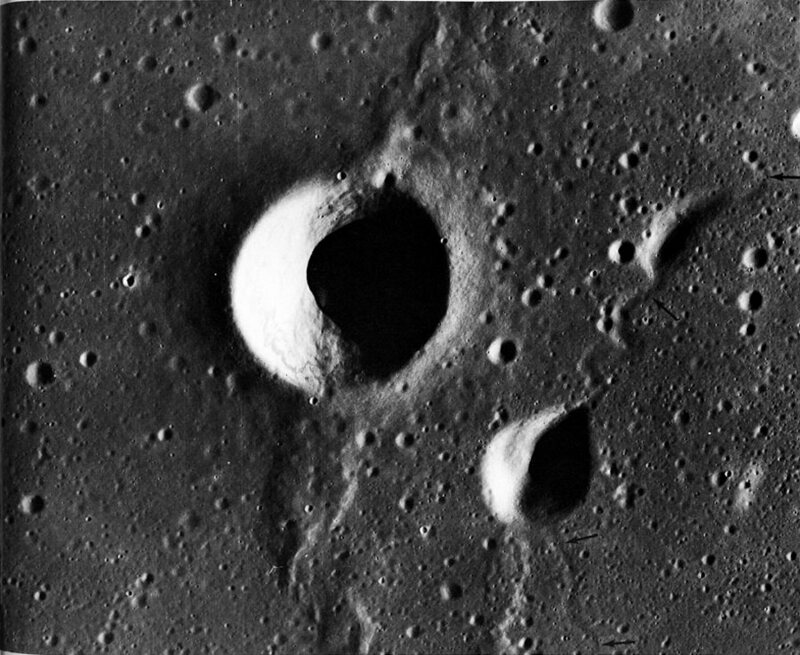 Craters containing bulbous material (arrows 2) that may be lavas extruded through the brecciated crater floor are visible. 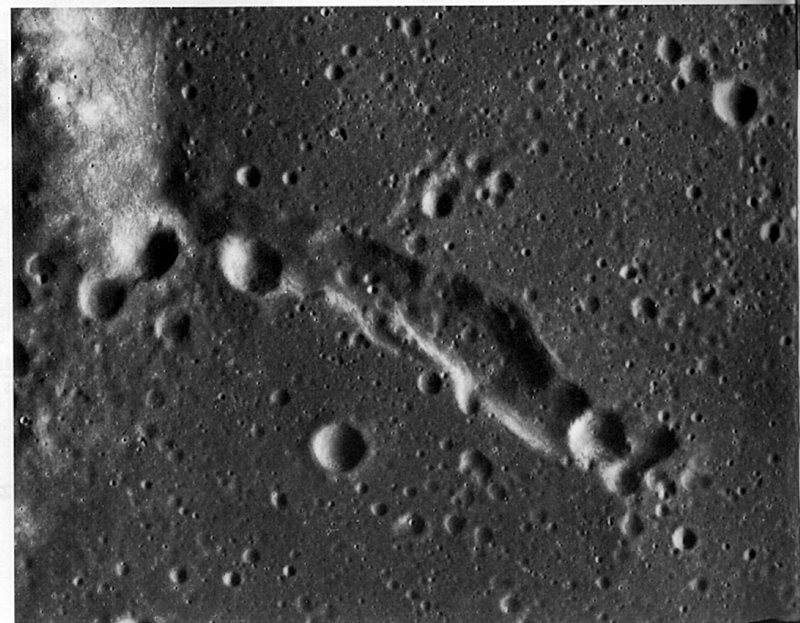 There are breached and partly flooded craters (arrow 3) and barely discernible flooded craters (arrow 4). Mantled remnants of uplands (arrow 5) are still visible. Terraces (arrow 6) mark the level of lava prior to subsidence in the center of the depression.-M.W. FIGURE 231 [left].- In this part of the area of figure 230, the terrace (arrow 1) is shown again. 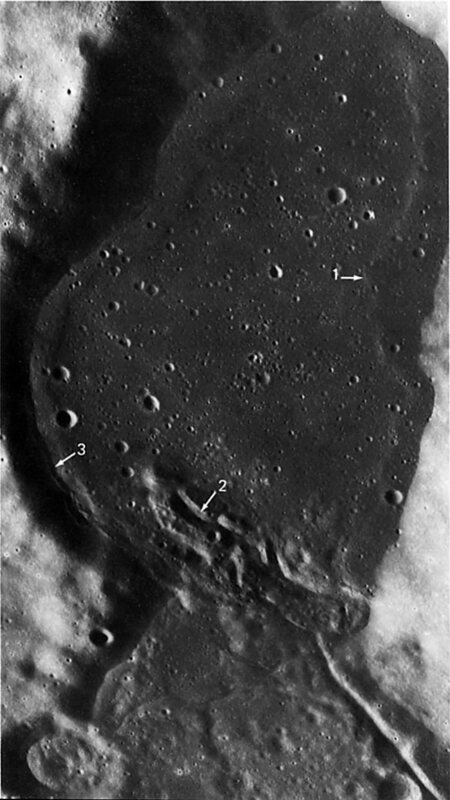 Other features shown here are a fracture with lava levees (arrow 2), a "strand line" (arrow 3) marking the level of lava before cooling and withdrawal, and a scarp of a fresh-appearing lava flow front (arrow 4).-M.W. FIGURE 232 [right].- The steep-walled but shallow D-shaped depression near the center of the photograph is apparently a unique feature. It is located in a patch of mare on the foothills of the Montes Haemus, west of Mare Serenitatis. Measured along its straight side, the depression is about 3 km wide. It is situated atop a very gentle circular dome that appears to be somewhat smoother than the surrounding mare surface. As is more clearly shown in the accompanying stereogram (fig. 233), the many bulbous structures on the floor give it a blisterlike appearance. The depression is believed to be volcanic, probably a caldera (El-Baz, 1973b). Figure 234 explains the probable sequence of events leading to the formation of this unusual structure.-F.E.-B. FIGURE 233 [right].- The enlarged view provided by this stereogram shows that there are at least three different types of material within the floor of the D-shaped depression. A brighter annulus parallels the wall, and darker material fills the inner floor. Within both areas numerous bulbous and slightly raised comical structures are easily distinguishable. 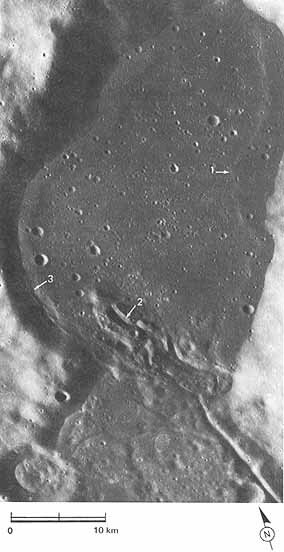 There are craters on the summits of many of the structures, suggesting that each one is probably an extrusive dome with a summit crater. 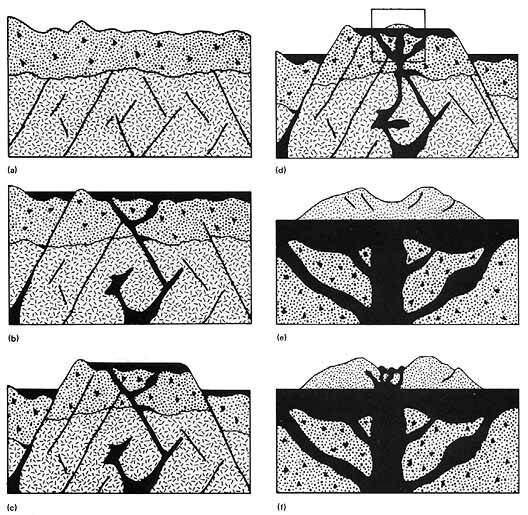 Many similar features on Earth are caused by the subterranean drainage of lavas following extrusion and release of pressure following the upward movement of a central plug.-F.E.-B. FIGURE 234 [above].- This diagram shows a postulated sequence of events leading to the formation of the D-shaped structure; the events are presented in order of occurrence: (a) Numerous faults were generated in the crust and a thick blanket of debris was deposited (upper layer) as a result of the gigantic impact event that formed the Imbrium basin. (b) Basaltic lavas migrated to the surface along fractures to form a small, probably thin layer of mare material. Higher areas escaped inundation. (c) Vertical displacement then occurred along major faults, and the inundated block was displaced upward relative to the surrounding blocks. (d) A broad, gentle volcanic dome formed. 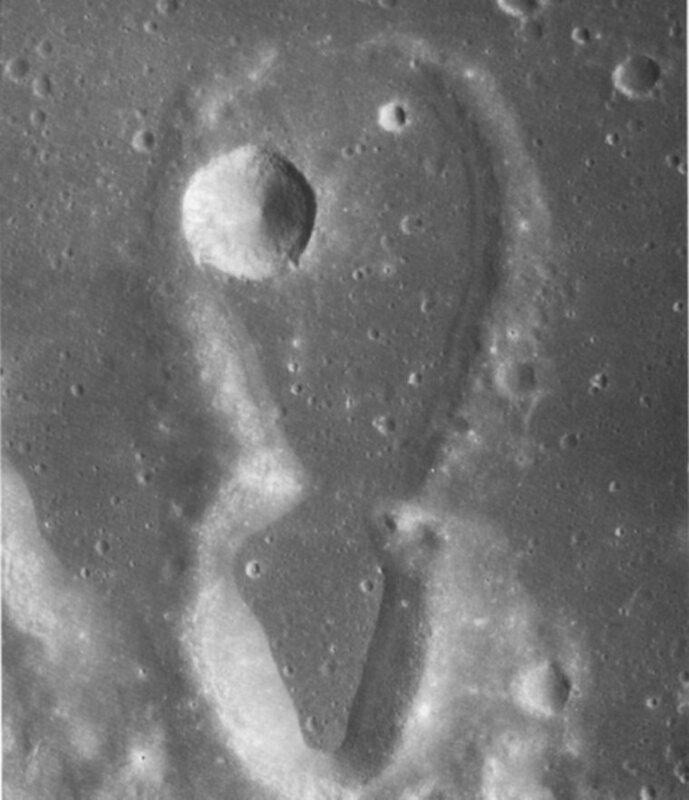 It is recognizable as a younger eruptive stage because its surface is less densely cratered than the surrounding mare surface. (e) The center of the dome collapsed to form the caldera. This segment is outlined in (d). (f) Many small extrusions of lava formed the bulbous structures on the caldera floor. The centers of some of these later collapsed to form small summit craters, thus, on a much smaller scale, repeating the earlier collapse caldera sequence.-F.E.-B.